That was a long time since last. It's a kind of odd experience. Now that the blog actually has lots and lots of readers, I feel some new sense of responsibility to actually write something. Lets look in the closet and see if we find something sweet to talk about. Khalsa Brain mats? Those are sweet indeed, but I already did it. An old school life counter perhaps? Yeah, that one is definitely coming. Not today though. Should do some more research before. Maybe the first Magic novella from 1994? I guess I should try to read it first. Also found a Shandalar game. Now that's something. Bought it back in 1997. Only works well on Windows though, and there's currently no computer in my possession running on anything less than Linux. I'll put that in the future-pile as well. A Legends-booster? Yeah, lets look at the Legends rule card. That could be a lark. Today I wont be writing about old school Magic. It will be a rare departure from the topic of this site, but figured it's my blog and I can occassionaly write whatever. Vote Bernie Sanders. Don't drink and drive. Night of the Hunter is awesome. Unit test your code. 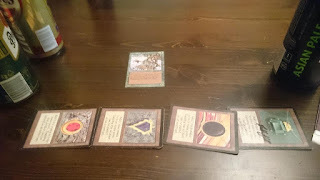 Here's a bad resolution pic of a bunch of moxen powering out a 0/0 Wood Elemental. A fortnight of vacation has passed. There were some pretty intense resting, and I haven't spent more than two nights in a row at a single place for the last two and a half weeks. My mind has been cleared though, and it actually feels a little relaxing to get back to work again. The Scandinavian summer is awesome btw, the sun is constant and everyone is up for good times. I guess we need it to survive the darkness and cold of the Nordic winters. Last weekend the annual Wexio gaming convention took place in Växjö, Sweden. After having spent the first week of my vacation walking in mountains, horseback riding and attending a country wedding, I felt that it was time to collect some old school nerd points. I got back to Oslo around midnight last Friday, and jumped on the train to Växjö at 7 in the morning.